China Hand-scratched,Solid bamboo,Stained bamboo flooring,Strand woven,Furniture board- Hangzhou Ecomax Bamboo Products Co.,LTD. 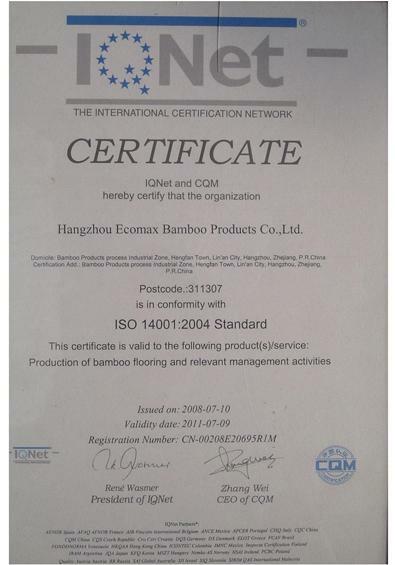 Hangzhou ECOMAX Bamboo Products Co.Ltd was established in 2002 covers an area of more than 80,000㎡.with more than 50 million RMB investment, ECOMAX is one of the top-level, modern bamboo flooring manufacturers in China, even around the world. Annually, it can produce more than 800,000㎡.bamboo floorings. 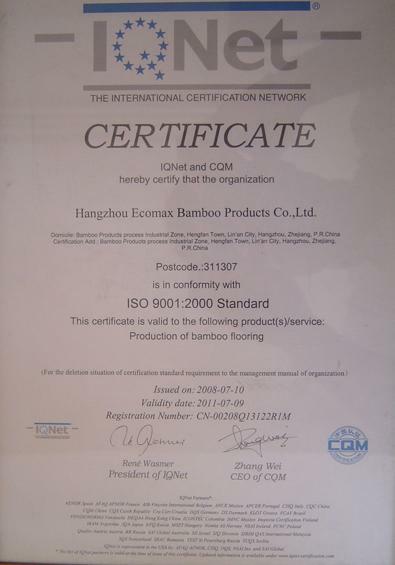 In 2005, ECOMAX BAMBOO & QINGFENG BAMBOO were officially united into NEW ECOAMX. Ecomax factory is specialized in flooring, panels and Qingfeng is focusing on all kind of accessories, bamboo furniture and some art work. More than 30 senior technicians, advanced equipments from Taiwan and Germany ,and close relationship with raw material supply base ensure our products with stable and continuous quality. Our company makes every effort to enforce inspecting raw materials and finished products, process control and many other rules and regulations. During the producing process, we perfectly adopt European E1-level glues, Japan Zero Formaldehyde F☆☆☆☆ glues and Germany wear-resisting UV paint that meet environmental protection standard. 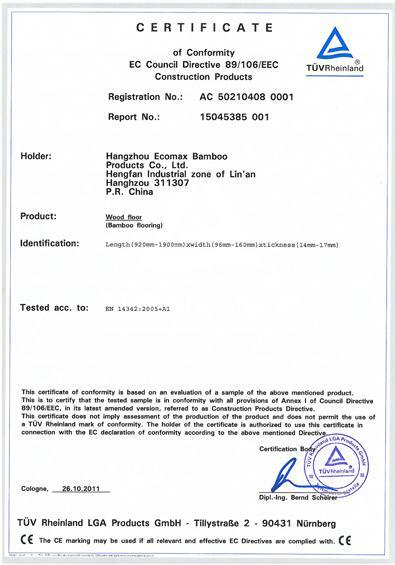 So our products are characterized by its “green” and environmental protection. And all quality indexes surpass the Chinese standards of GB/T 20240-2006 for environmental protection products. 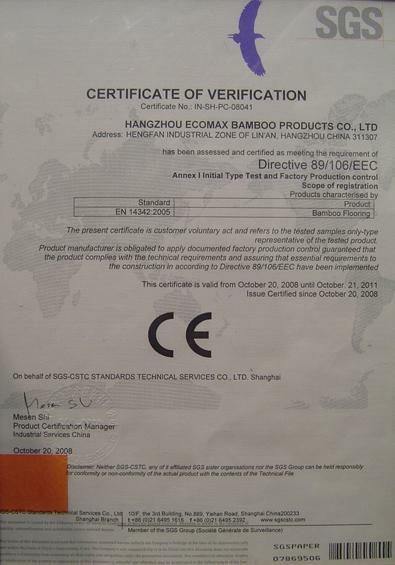 Ecomax won AAA Credit Enterprise during passed 4 years, passed ISO9001, ISO14001,and our products gained CE certificate etc. In 2007, our Ecomax won ”Golden medal in Agriculture Exhibition of Zhejiang province ” ,in 2008, “Ten Best Agriculture products manufactures” issued by Hangzhou city Government, and “Leading manufacture of Agriculture products ” by Zhejiang province Government. Located in Hengfan Industrial Zone of Li’an, a national forest city in Zhejiang province, our company is only 45㎞ far from Huangzhou, and 230㎞from Shanghai. Thus the traffic is very convenient. All of our products are exported to the international markets with a high reputation. 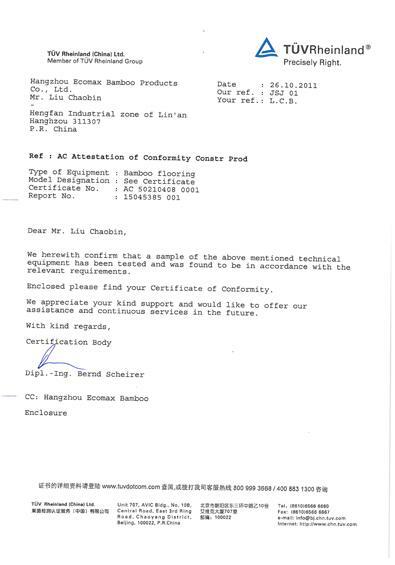 Honesty and credit is our principle, high quality and customers’ satisfaction are our pursuit. We believe, with our effects, we can get well along in our business.